Many Americans are looking for ways to finally unload their credit card debt. They’re carefully budgeting their monthly finances, but still, many just aren’t reducing those bottom lines quickly enough. While it surely feels like a traditional savings account, the truth is, the dynamics behind a 401(k) are anything but an easily accessed savings account or rainy day fund. There are many red flags associated with taking out a loan against your retirement funds, including the possibility that if you are fired or laid off from your job, you will likely be required to pay that money immediately or face stiff fines and penalties, which of course, is the last thing you need on top of realizing you’ve just lost your source of income. For those who are already trying to juggle several credit cards, this new problem not only doesn’t fix your old ones, but it adds to the already too-heavy burden you’re feeling. And don’t assume your job is safe, either. One woman who, against her own inner voice and her accountant’s advice, borrowed from her employer sponsored retirement fund with the belief that job security would be her one saving grace. Less than six months later, the government canceled her employer’s most lucrative contract. That resulted in layoffs of close to 70% of her company’s workforce – she was one of those less fortunate souls who found themselves with the proverbial pink slip. Worse, she now had the loan to worry about and whatever wasn’t paid back in the brief 60 day window she was provided would be treated as income and therefore, taxed. Not only are you no longer earning interest on the money you’ve borrowed, but some employers have stipulations in the program that prevent you from making contributions to your retirement until the loan is paid back. That means you’re going to be paying back, but your fund in the meantime is sitting idly, not earning on several levels. And this nonsense about paying yourself interest? Don’t fall into that trap that includes believing it will all balance out in the long run – it never does. Do the math and see for yourself. 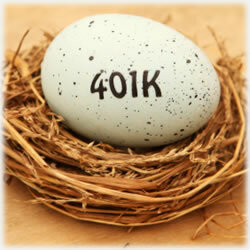 That’s right – most loans against retirement plans include payroll deductions. But – it may also be that you’re taxed on that money before the deduction is made. So again, you may find yourself facing taxes on several levels along with the absence of earning potential while you’re in this state of limbo. Meanwhile, your other expenses are still due and if you’ve made the decision after paying the credit card balance in full to once again use your credit cards, then you’re right back at square one minus the net worth you once had. Instead of opting for this avenue, have you considered approaching your bank or credit union for some kind of consolidation loan? It’s always better to consider this before you find yourself in a financial crisis since it’s likely your credit scores haven’t taken a hit at this point. If you have missed payments in recent months and you’re sure your credit scores are reflecting that, it’s still worth looking into to. After all, it’s in your bank’s best interest to work with you to keep your credit reputation in tip top shape. It wants to know you’ll think of them in several years when you’re ready to take out a home improvement loan. At a minimum, your banker, even if he can’t approve a loan, will be able to provide other alternatives you’ve not yet considered. Remember, your goal is to get your credit card balances paid off and settle back into a regular sleep routine, right? It just might be the friendly neighborhood bank president is better than any sleeping pill. Finally, and this may not seem like a solution, but for those well-disciplined folks, it very well could be. You might want to consider moving your credit card balances to a new credit card account that offers an intro 0% APR for balance transfers. You’ll need to really take advantage of that window of time so that you can get as much knocked out as possible. It will take some time, but many consumers report that by combining the balances from their three credit cards onto a single card meant more money each month that could be applied to that one balance versus spreading out minimum payments across three credit cards. Only you can decide what the best avenue is, but taking out a loan against your retirement should the last ditch, “no other option available” consideration.